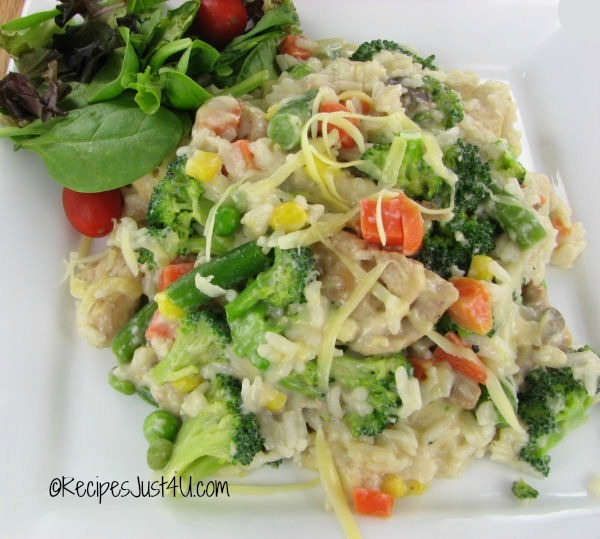 If you are looking for an easy stove top chicken recipe with tons of flavor, you can’t go wrong with this broccoli cheese chicken and rice skillet dish. It has just six ingredients and is easy as can be. It is one of my favorite 30 minute meals. One pot meals are a big hit at our house. The flavors get a chance to develop as they are slowly added and clean up is a breeze later. Win – win in my book! Broccoli is one of the favorite veggies in our house. I love using it in broccoli salads, main courses and soups. For today’s recipe, I’m making a delicious skillet recipe that features broccoli. The recipe could not be easier to make. 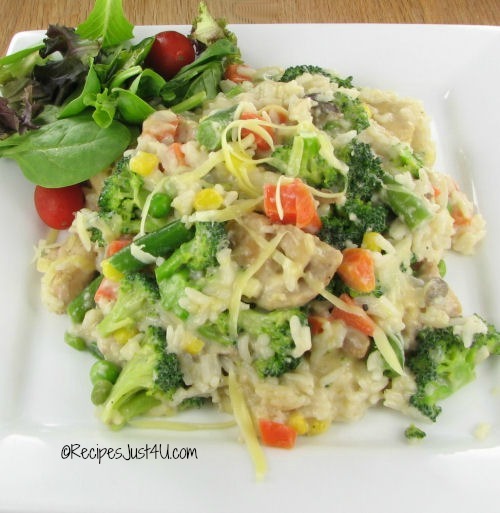 Just cook the chicken thigh pieces until lightly browned, add the broccoli and then the remainder of the ingredients and stir in the cheese just before serving. This makes a hearty and delicious meal for those weeknights when you are in a real hurry to get something on the table. Serve with a side salad and some herbed garlic bread. Your family will ask for this again and again! Add the broccoli florets and continue cooking until they are al dente, about 5 minutes. 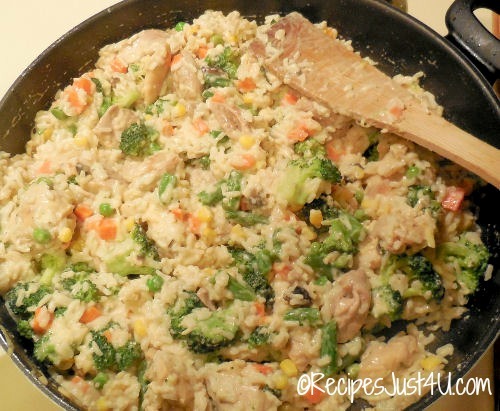 Add the recipe starter sauce and frozen vegetables and stir in the uncooked instant rice. If you want to add the wine, stir it in at this stage. Just before serving, stir through the shredded cheddar cheese.